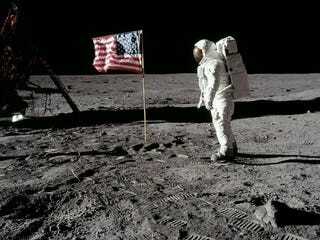 Forty-five years ago, humanity landed on the Moon for the first time. Back then, 2001 was very much in everyone's minds, and they all believed that by the real 2001, we'd have space colonies, cities on the Moon, and settlements on Mars. They failed to realize that the future is often at the mercy of the whims of money and politics, and that money and politics — for the moment — will triumph over science and the future almost every time. Since the general public was getting bored of the Moon missions (probably because they didn't see any progress on the settlement front) and the United States was entering the Nixonian malaise of the Seventies, NASA was gutted and Clarke's vision became another science fictional pipe dream. But dreams die hard. And though the Apollo missions ended, the new Space Shuttle program took up the torch used to ignite humanity's imagination. Despite two catastrophic tragedies — Challenger and Columbia — the Shuttle program lasted for thirty years and was the backbone of NASA's quest to build orbital research stations including Skylab, the Hubble Telescope, and the International Space Station. It is often overlooked that the shuttle program lasted fifteen years longer than it was originally meant to, and far from being a failure, was indeed a great success. While the Russians currently have a virtual monopoly on manned spaceflights, the United States will soon return to that arena with a variety of vehicles, including the Dream Chaser reuseable spaceplane, the Dragon spacecraft, the CST-100 space capsule, and the Orion spacecraft. China regularly sends manned missions into orbit, while Japan, India, Malaysia, and Iran are planning their own missions. SpaceShipTwo is about to open up space for tourism, though it's only feasible for the wealthy at the moment. This is all only the beginning. By 2016, Russia plans to have the first space hotel orbiting Earth (again, feasible only for the super-wealthy). The iffy Mars One program notwithstanding, Russia, the United States, and China are all planning the first manned missions to Mars to commence within the next two decades. Whether that actually happens or not, is all up to funding. But we will get to Mars and the other planets eventually. It's just a matter of when and what form we will be in when we get there. Our colonization of the Solar System — and the galaxy beyond — will depend a great deal on propulsion technology. Right now, we don't have the tech we need to make exploration realistic beyond the Moon. Even Mars is seriously pushing it. I know I wouldn't want to be stuck in a metallic tomb for six months just to visit a desert planet. It's one of those things that sounds cool until you really think about it, and then it just sounds awful. Now cut the travel time down to a week, and I'll sign up. Now, I'm not an astronaut, and most astronauts would jump at the chance to go to Mars no matter how long the journey takes. So why care what I think? Because I'm not an astronaut. Neither are seven billion other people on this planet. And I guarantee the only way to get to Mars is to make them want to go. And they won't want to go until they know the tech exists to get them there somewhat quickly and comfortably. That's why I say trips to Mars should wait until we have more advanced propulsion, engines that can get us to Mars in a week or two instead of six to nine months. One promising proposal is the quantum vacuum plasma thruster. The thruster takes advantage of quantum fluctuations and the Casimir effect to create thrust, and has enormous potential for intra-Solar exploration. A trip from Earth to Neptune could take only a little over three months. Mars would be mere days away. The thruster is decades away at best, but will eventually happen. Once it does, the Solar System will be ours for the taking, at least travel-wise. In the meantime, space hotels will become space toruses, which in turn will become orbital rings. Space elevators will bring up supplies and people to shuttle docks, which will then ferry them over to the space habitats. The habitats, combined with new cities on Earth, will do much to relieve the planet's burden during the Restoration. These settlements will spread throughout the Solar System, and be in orbit of every planet. Colonies will also develop on asteroids, moons, comets, as well as hang free in space. As for the settlement of the planets themselves, while terraforming plans and a few domed research stations will exist, there will be no widespread settlement of the planets themselves.